OK, there's probably nothing here that you haven't heard before. Whether you want to hear them again as done by Warren Zevon and three-quarters of R.E.M. in an impromptu setting from the tail end of sessions for Warren Zevon’s Sentimental Hygiene is another situation where mileages may vary. An R.E.M. 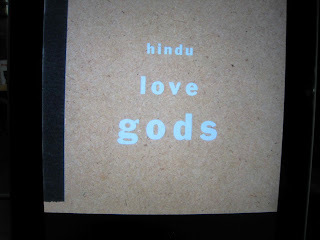 spinoff called the Hindu Love Gods played three one off gigs in Athens, Georgia in February and June 1984, with the instrumental component of R.E.M. (Bill Berry on drums, Peter Buck on guitar) and bassist Mike Mills joined by Bryan Cook (vocals and piano), R.E.M. singer Michael Stipe (vocals and drums) and Zevon on vocals. There was no Zevon or Stipe involvement for the first gig (on Valentine’s Day, with a setlist reading Bangkok, With A Girl Like You, I'm Through With You, Walk, Don't Run, Personality Crisis, Narrator, California Sun, Pipeline, Needles And Pins, Government Center, Hippy Hippy Shake, (I'm Not Your) Stepping Stone, Permanent Vacation, Jump, Color Me Impressed). There was a second show a fortnight later, with Zevon and Stipe on board (Up On The Cross, Boom Boom Mancini, Trouble Waiting To Happen, Werewolves Of London, Gonna Have A Good Time Tonight [Bryan Cook vocal], Little America and Second Guessing [ both Stipe vocals], Gloria, Rebel Rebel, Wild Thing). One notes the presence of Boom Boom Mancini and Trouble Waiting To Happen, both of which appeared in Sentimental Hygiene three years later. A third gig in June was back to the Cook/Berry/Buck/Mills configuration and was followed by a studio session (Berry/Buck/Cook/Mills/Zevon) that produced a single Gonna Have A Good Time Tonight (the old Easybeats number)/Narrator. Given the fact that the whole R.E.M./Hindu Love Gods bit gets only passing references in the Warren Zevon biography (I’ll Sleep When I’m Dead: The Dirty Life and Times of Warren Zevon) there’s no way you can be sure of anything beyond what’s outlined above (and those set-lists suggest some form of magnetic memory) but this period seems to have produced a set of demo tapes (p. 191 of the bio) and you’d assume there was a fair bit of general jamming along the way. Zevon didn’t have a recording contract at the time, attempts to hawk the demos around the majors failed to produce one and it wasn’t until 1987 that Virgin came on board and Zevon was back in collaboration with R.E.M. for the sessions that produced both this album and Sentimental Hygiene, which was released at the end of August that year. Zevon was apparently still drinking at this stage, and an all-night studio session which seems to have involved studio time that had been budgeted for but was surplus to Sentimental Hygiene requirements produced the ten covers, released by Giant Records three years later as Hindu Love Gods. Again, there’s no way to be sure of the actual ins and outs of the process, but there’s a lively step to their cover of Robert Johnson’s Walkin’ Blues, Zevon barks out the lyrics in an impassioned manner and the migratory theme continues as Travellin' Riverside Blues (another Robert Johnson track) gets a thorough going over in bar band mode. It’s something that would work reasonably well in a bar. There was enough personality in Raspberry Beret to have it enter the charts as a single, but with Crosscut Saw and Junko Partner we’re thoroughly back in basic barroom blues band mode, though there aren’t too many basic barroom blues bands fronted by the likes of Warren Zevon. Mannish Boy, Willie Dixon’s Wang Dang Doodle and a cover of the Georgia Satellites’ Battleship Chains rock along nicely, and an off the wall selection in the form of Johnny Horton’s I'm a One-Woman Man is delivered with a suitably feral yelp. A fairly straightforward reading of Woody Guthrie’s Vigilante Man winds things up, and while you’ve heard most of these tracks done better in other settings there’s enough of a vibe here to make this collection work in an appropriate environment. For maximum effect, that environment should involve maximum volume and readily available drink in substantial quantities and a couple of fellow Zevon aficionados. If that’s not possible, there’s probably room for a couple of loose, spirited readings of this material in the average rock listener’s playlist, though whether your average rock listener’s going to shell out $16.99 for the whole thing is probably problematic. If you’re a Zevon fan, on the other hand, and one who enjoys Warren in rowdy, unhinged boozer mode (if you enjoyed Stand in the Fire’s rowdy rampage, for example) it’s probably a no-brainer. It’ll take a while before some of these will end up on the fringes of Hughesy’s Top 1500 Most Played, but Raspberry Beret will almost certainly end up there.